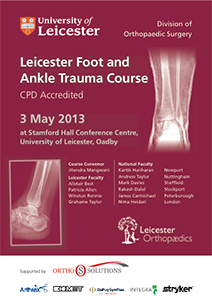 The annual Leicester University Hospitals Foot Trauma course invited Mr Carmichael as a guest lecturer. Topics covered during the course included fractures of the Ankle, Calcaneus, Talus, mid foot injuries and compartment syndrome of the foot and ankle. A mixture of lectures and practical sessions was well received by delegates ranging from junior medical trainees to established orthopaedic consultants.